It started when I looked up from what I was doing. The skies were getting dark and we weren't supposed to have rain that day. Checking radar it was clear. Then a dot formed about 1/2 a mile away in the "bad neighborhood" of Fort Lauderdale South of us. The next radar frame came six minutes later and that dot was now covering Wilton Manors with green. It's not a big place, one mile from North to South, three miles wide. Six minutes later we already knew it was starting to rain. I was watching it from the kitchen window splat the pool with giant water drops. It went from nothing to that in an eye blink. Putting the water on, I was making Mac and Cheese for lunch. By the time it was off the stove and I was mixing the cheese sauce, the rain was biblical. From stove to table in 12 minutes, the storm blew up. The mangoes fell from the tree across the street, their fence fell over onto the car next door in the duplex. Aunt Betty's chair blew from my front porch into Kevin's car in the driveway. The flag flew then flew over the house and landed in the bougainvillea out back. It was raining through the Jalousie windows and hitting the back of my neck. It never rains inside the house, or even gets the front windows wet unless it's a real gully washer. FLABOOM! Well, you get the picture. The lightning strikes were within a property away. This was rain unlike anything I ever expected, and since I moved to Florida after Wilma, I haven't experienced what it was like to have Mother Nature act like a Real Mother. Moving my Mac and Cheese to the interior of the house, the lightning took out first the Internet, then the electric power in short bursts. It went out for an hour or so that time. I managed to finish lunch while the winds howled like a freight train, but only for a few minutes. The green blob on Radar had turned yellow, then orange, then red. Luckily that freight train sound was brief, the lightning started to shift from the front of the house to the back signalling that we weren't sitting at the epicenter of the cell any more and it was moving South. Since Radar had been stuck with no Internet to feed it, I hibernated the laptop. The rain went from Biblical to merely a monsoon, to rain and petered out over the next half hour. Going outside, we gathered up Betty's Chair and got the flag out of the backyard. The chair survived, the flag was in tatters from the trip along with the pole that had a neat bend in the middle approximating 90 degrees. That won't work, plus who uses a metal flag pole in Florida anyway? Lightning rod would be a better description. At that point we started hearing about the tree that fell over from our neighbor Bill. 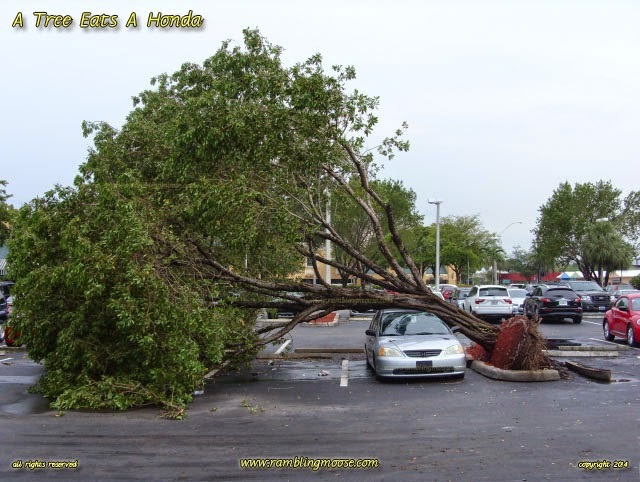 He had taken his truck out for a lap around the neighborhood and said a tree in the parking lot of the Shoppes had fallen over. Since we still had no internet and power, we were going to take Rack for his walk, then a ride down to Kevin's office to check things out there. I brought a camera. Bill was right. It was a Honda Civic being eaten by a tree. According to Bar Security, the guy who owned it had only "PIP" insurance so this wasn't going to be covered. The pavement under the tree had been lifted up and dropped by the tree falling, and roots under the pavement were severed by the falling. Just that morning I had walked Rack through that same spot thinking that a tree root pulling up the pavement meant the tree couldn't have been all that stable. Getting Rack out into the car after our walk around town, I noticed that the further from Wilton Manors we got, the less damage there was. The heat island effect of downtown Fort Lauderdale forced the storm around it. It swerved to the Southwest of downtown Fort Lauderdale, then went South by way of the Fort Lauderdale Airport. A lightning strike there left a crater in one of the runways. I guess they were out there fixing that because as we drove south to the office, we watched a jet take off over Federal Highway, heading East over the ocean before turning North to its destination. Funny how these things crop up from time to time. A Lightning strike can hit 10 miles away from the cell itself. You wouldn't even know what hit you. By the time we hit the SE 17th Street Causeway area, it looked like a passing sunshower had gone by, nothing really notable.